The pan-Arab London daily Hayat [Life] reports that members of the al-Anbar provincial council say they have met with American officials who are “disgusted” and the slowness of Baghdad to arm the Sunni Arab tribes fighting ISIL. Last week 220 members of the Al-Bu Nimr tribe were murdered by ISIL for taking up arms against them. Now another 50 bodies have been found. Al-Hayat says that Sunni Arabs in al-Anbar believe that the national unity government in Baghdad (still dominated by fundamentalist Shiites) does not trust the Sunni al-Anbar tribes and is not sure about arming them. Moreover, he said, Baghdad has a relatively small circle of al-Anbar notables that the members of the government know and trust. But these individuals are not necessarily very powerful on the ground out in the province. Sha`lan al-Nimrawi, a leader of the Al-Bu Nimr tribe, told al-Hayat that many of his people have been forcibly displaced and are wandering in the desert–women and children included. He said he’s been in touch with the US and the Baghdad government but no one has intervened. He said the al-Abadi administration told him that they were afraid to send out rescue forces because ISIL might be using the displaced civilians as bait to lure government troops into a trap. Nimrawi said that at that point he was angered and hung up. Al-Hayat reports that the US is thinking about arming and training the Sunni tribes itself, but that report contradicts what Gen. Martin Dempsey has said about needing the Iraqi government itself to do the arming. 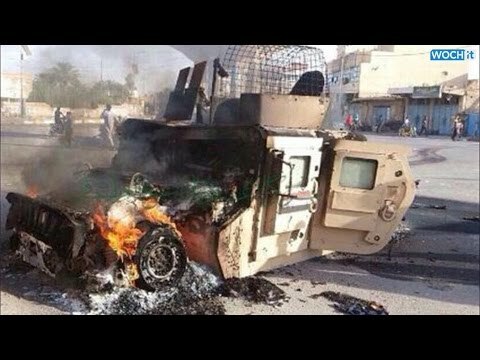 The problem in Iraq is similar to that in Syria. The Baghdad government only wants to see ISIL destroyed if it can pick up the pieces and assert itself. It doesn’t want armed Sunni Arab tribesmen taking over al-Anbar, either. And Baghdad doesn’t trust the tribesmen, some of whom have fought the Shiite government in the past. In Syria, Turkey is not getting involved very much in defending Kobane because it doesn’t want to see the leftist, Kurdish separatists of the PKK and their Syrian allies strengthened. ISIL is benefiting from the ambivalence of the two major powers in the region to assert itself beyond what its military capabilities alone would really allow.